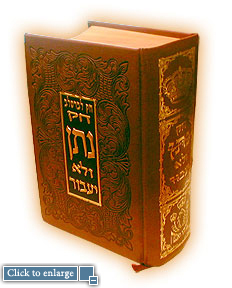 Chok Natan was compiled under the direct guidance of Rabbenu, the Rosh Yeshiva. Chok Natan is a comprehensive book encompassing all main Breslov works divided into daily lessons and designed to be covered over the course of a year. It includes 11 Breslov works, the Orach Chaim section of Shulchan Aruch (Code of Laws) and during a leap year, two additional books. 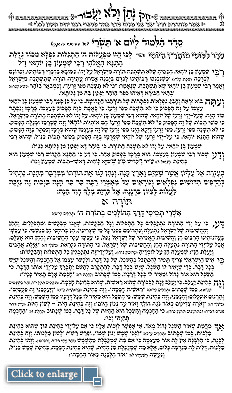 The Orach Chaim section of Shulchan Aruch, is appropriate and customary for every Jew to learn. During a leap year, "Hishtapchut HaNefesh" (Outpouring of the Soul) and "Meshivat Nefesh" (Restore My Soul) are added. Our leader, the Rosh Yeshiva, wanted to publish this book years ago. We contacted several publishing houses and for various reasons, the project did not come to fruitition. After some time, the Yeshiva retook upon itself the project and through Hashem's mercy fulfilled the will of the Tzaddik and we merited publishing the book in 5763 (2003). The book is exceptionally laid out, divided in an organized fashion, and is easy on the eyes. As a combination of 14 main Breslov works in one, it serves as a convenient companion for every Jew. One can always have these works with him: Rebbe Nachman's lessons, Reb Nosson's prayers, Shulchan Aruch. These are works that every Jew should have easy access to, especially a Breslover Chassid. As the exalted, saintly Reb Nosson said in his will: "compell yourself very strongly to learn the works of Rebbe Nachman every day...whether a little, or a lot regarding all different facets... A day should not pass without learning from Rebbe Nachman's works and from Shulchan Aruch. And, Hashem should help you add and learn even more". If you learn the ascribed 5 pages a day - which take 15-20 minutes alone - you finish everything in one year! It's amazing!!! Once he was greatly praising his book and said it is possible to become a complete ba'al teshuva (master of repentance) just from learning his books. And, he wanted very much for his books to be constantly reprinted and spread throughout the world. And, he said that there will be people who will learn and pray through this book. And, he said that one who sits and studies his books honestly without the trait of victory, then certainly the sinews of his heart's obstinacy will be taken apart. And, he said that every person should make effort to buy his book. And, one who doesn't have the means with which to purchase it (should sell his other books to buy this book and one who doesn't have even that, and so on), should sell the pillow from under his head and buy his book. Up until this point, quotes were from Chayei Moharan. Praised are we that we merited this awesome book! And many thanks to the Creator of the Universe that he brought these books to light in the world. With great praise and thanks to Rebbe Nachman, zt'l, and his student, Rabbenu, Reb Nosson, zt'l, that chose us to print this book. Dear Jew, you can also eternal aquire merits for the World to Come by learning from the works of Rebbe Nachman, whose works are exalted, all in just fifteen minutes a day. On this site, you can join our daily learning program in which many already participate. Just click on today's date and you can begin learning!! !